1. Department of Obstetrics & Gynecology, The Second Affiliated Hospital of Nanchang University, Nanchang, Jiangxi 330006, PR China. 2. Jiangxi Maternal and Child Health Hospital, Jiangxi 330006, PR China. 3. Department of Obstetrics & Gynecology, The First Affiliated Hospital of Nanchang University, Nanchang, Jiangxi 330006, PR China. 4. Department of Obstetrics & Gynecology, Ying Tan People's Hospital, 335000, PR China. 5. Jiangxi health vocational college, 330029, PR China. 6. Institute of Translational Medicine, Nanchang University, Nanchang, Jiangxi 330031, PR China. *Hui Hu & Liping Luo contributed equally to this work. Introduction: Advanced ovarian cancer is the main cause of ovarian cancer deaths, and it is important to seek safe and effective phytochemicals to suppress cancer or lower the chemotherapy resistance of ovarian cancer. Methods: This study evaluated the effect of Triptolide (TPL) on the proliferation, cycle distribution, apoptosis, and ultra-structure of COC1/DDP cells in vitro, as well as the anti-cancer effect and sensibilisation effect of TPL in vivo. Results: The results indicated that TPL could significantly inhibit the growth of COC1/DDP cells (P<0.05), and 3 ng/ml TPL and 50 ng/ml TPL made COC1/DDP cells present obvious apoptosis characteristics and arrest 35% and 55% of COC/DDP cells in the G0/G1 phase, respectively (P<0.05). The animal experiments also indicated that 0.1mg/kg.d TPL significantly reduced the tumour weight and the spleen cell transformation rate (SI), and it lowered the inflammatory factors IL-2 and TNF-a in rat serum (P<0.05). Moreover, the significant reduction of p-Akt and p-GSK3β made the TPL+DDP possess the highest apoptosis rate [(51.13±3.325)%] in COC1/DDP cells. Conclusions: TPL used in combination with DDP may produce a synergistic anti-cancer effect that warrants further investigation for its potential clinical applications in the treatment of epithelial ovarian cancer. Keywords: Triptolide, Cisplatin, PI3K/Akt, COC1/DDP, Sensibilisation. With more than 23,000 new cases diagnosed annually, ovarian cancer is the fifth leading cause of cancer mortality in women and results in 14,000 deaths annually . As the most common type of ovarian cancer, epithelial ovarian cancer (EOC) is typically diagnosed at an advanced stage due to the lack of effective screening strategies. The routine procedure of the combination of surgical resection and cisplatin‑based chemotherapy can prolong clinical remission in patients, but the overall survival of patients with advanced disease is rarely >30%, mainly due to chemoresistance for the intrinsic and acquired resistance, severe side effects, severe toxicity, and functional impairment in ovarian cancer patients [2-7]. Therefore, it is necessary to find anti-cancer agents for EOC or a sensitiser to cisplatin. As one of the most promising phytochemicals, Triptolide (TPL) is purified from the Thundergod vine, Tripterygium wilfordii Hook. f, and has been used as an anti-inflammatory agent for diseases such as rheumatoid arthritis for centuries in Chinese natural medicine. It has also been recognized as a potential drug for a variety of cancers [5, 8-13]. However, few studies have evaluated the anti-cancer effect and sensitisation effect of TPL in EOC treatments. In previous studies, TPL showed potential in inducing apoptosis through the inhibition of NF‑κB in a p53‑independent pathway, producing reactive oxygen species (ROS) and inactivating the PI3K/Akt signal pathway [13-17]. The PI3K/Akt pathway is an intracellular signaling pathway that is important in regulating the cell cycle, and it is therefore directly related to cell growth, proliferation, metabolism, survival, apoptosis, angiogenesis, and tumourigenesis [18, 19]. In many cancers, this pathway is overactive (reducing apoptosis and allowing proliferation), and it is important to control an appropriate amount of proliferation versus differentiation via the PI3K/Akt pathway in the development of various therapies . In the present study, we studied the role of the anti-cancer effect of TPL both in vitro and in vivo, and we further evaluated the sensitisation effects of TPL via inhibiting the overexpression of PI3K/Akt pathway-related proteins in vitro. The human ovarian carcinoma‑derived COC1/DDP (platinum resistant) were cultured in RPMI‑1640 medium supplemented with fetal bovine serum (10%) and penicillin / streptomycin (100 U/ml) and kept in a 5% humidified CO2 atmosphere at 37˚C. To maintain the acquired resistance to cisplatin, 0.5 μg/ml cisplatin was added into the culture media of COC1/DDP. Cell proliferation assays were performed by seeding 5 x 104 cells in 6-well plates and cultured for 1, 2, 3, 4, 5, 6, 7, 8, and 9 days, and cell proliferation was determined by cell numbers recorded by a TC10 Automated Cell Counter (Bio-Rad) on indicated days. Cells were fixed with 70% ice-cold ethanol and stained with PI solution (25 μg/mL PI, 180 U/mL RNase, 0.1% Triton X-100, and 30 mg/mL polyethylene glycol in 4 mM citrate buffer, pH 7.8; Sigma Chemical). The DNA content was determined using a FACScan flow cytometer (Becton Dickinson, San Jose, CA, USA). The cell cycle distribution was analysed using FlowJo software (Treestar, Inc., San Carlos, CA, USA). The treated cells were harvested and washed twice with cold phosphate‑buffered saline (PBS). The cells were suspended with a binding buffer and stained with Annexin V‑FITC and PI. The cell mixture was incubated for 15 min at room temperature in the dark followed by fluorescence‑activated cell sorting (FACS) cater‑plus flow cytometry (Becton Dickinson, San Jose, CA, USA). COC1/DDP cells (1×106 cells/ml) were seeded in 6-well plates and treated with different drugs in an incubator at 37 °C. The cells were double fixed in 2.5% glutaraldehyde and 1% osmium tetroxide acid. The ultrastructure changes of cells were assayed under transmission electron microscopy (H-600, HITACHI, Japan) . NuTu-19 cells were cultured in DMEM (Gibco Life Technologies, Grand Island, NY, USA) supplemented with 10% heat-inactivated fetal bovine serum, penicillin 1%, and streptomycin 1%. Cell culture plates were incubated under standardized conditions (5% carbon dioxide, 100% humidity, 37◦C). To establish primary tumour xenografts, 2×107/ml NuTu-19 cells were injected in the F344 rats in a volume of 200 μl of PBS using an insulin syringe. The rats were examined daily by a blinded observer for signs of morbidity. After the tumour xenografts reached a size of 0.4×0.4cm2, the rats were divided into a control group (2ml PBS, twice a day, n=8), DDP group (3 mg/kg/d DDP, twice a day, n=8), TPL-A group (0.1mg/kg.d TPL, twice a day, n=8), TPL-B group (0.05 mg/kg.d TPL, twice a day, n=8), and TPL-C group (0.025mg/kg.d TPL, twice a day, n=8). All the groups received five continuous administrations and were sacrificed, and the tumour xenografts were removed, measured, and weighed. The animal study was approved by the ethics committee of the second affiliated hospital of Nanchang University, and all the methods were carried out in accordance with the approved guidelines. The products of IL-2 and TNF-α in rat sera were determined using the ELISA kit for IL-2 (eBioscience) and TNF-α (eBioscience). Whole-cell lysates were prepared using cell lysis buffer supplemented with protease inhibitor cocktail and 1 mM PMSF . Protein concentrations were measured and then resolved by polyacrylamide gel electrophoresis. After electrotransfer to polyvinylidene difluoride membranes, nonspecific binding sites were blocked with 5% nonfat milk in TBST for 1 h at room temperature. Membranes were incubated with primary antibodies overnight at 4 °C, washed with TBST, and then incubated with the appropriate HRP conjugated secondary antibody for 1 h at room temperature. Immune complexes were visualized using enhanced chemiluminescence. Consistent loading and transfer were confirmed by probing the same membrane with anti-β-actin. Data are presented as mean ± SD and analyzed using Student's t test. P < 0.05 was considered statistically significant. As shown in Fig 1A, COC1/DDP cells reached their plateau at 5-6 days. 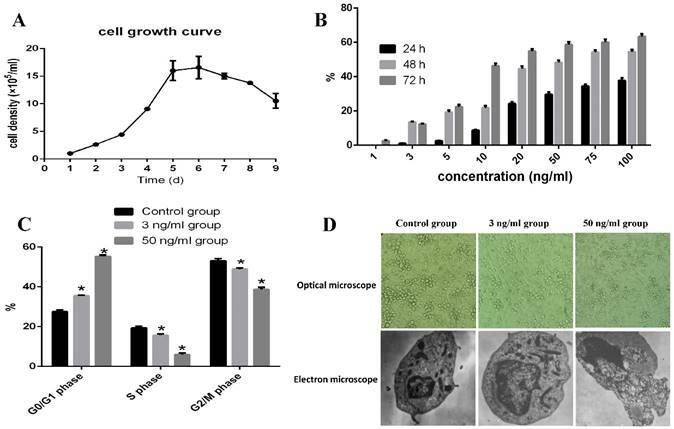 When 1, 3, 5, 10, 20, 50, 75, and 100 ng/ml TPL were added in the culture media and cultured for 24, 48, and 72h, 3 ng/ml TPL inhibited the growth of COC1/DDP cells (13.5%) at 48h.Only 40% of the COC1/DDP cells survived at the concentration of 50 ng/ml at 72h, and the IC50 of TPL on COC1/DDP cells were 51.76ng/ml (48h) and 10.78ng/ml (72h), respectively (Fig 1B). Therefore, 3 ng/ml and 50 ng/ml TPL were used as the low and high concentrations to evaluate their effects on cell apoptosis. As shown in Fig 1C, both the low and high concentrations of TPL significantly arrested COC1/DDP cells in the G0/G1 phase of 35% and 55% (P<0.05), and 3 ng/ml TPL increased the cell volume and nucleus, the chromatin in nucleus occurred gathered, pyknosis, fracture, dissolved, and nuclear membrane invagination, and some signs of cell senescence, such asvacuolation, mitochondria number and shape changes, and golgi body fracture, were seen (Fig 1D), and 50 ng/ml TPL had disappeared the microvillus on cell surface, increased the mitochondria and expanded the endoplasmic reticulum, and some chromatin in nucleolus presented as a crumby structure and bicornuous, gathered around nuclear membrane, and formed an apoptoticbody. Evaluation of the apoptosis effect of TPL on COC/DDP cell lines. A: growth curve of COC/DDP cell lines. B: inhibition of different concentrations of TPL on COC/DDP cells at 24h, 48h, and 72h. C: effect of TPL on the cell cycle of COC/DDP cells. D: effect of TPL on the morphological changes of COC/DDP cells using optical microscope (10 X10) and electron microscope (5 X1000). n=5. To investigate the anti-cancer effects of TPL on tumours, the DDP, different concentrations of TPL were intraperitoneally injected into rats. As shown in Table 1, 0.1mg/kg.d TPL and 3 mg/kg/d DDP significantly reduced the tumour weights compared with the control group (P<0.05), and the tumour weight in the TPL-A group was0.514±0.151g, which was comparable with the DDP group (0.493±0.121g). Moreover, all the TPL groups inhibited the splenic lymphocyte transformation ratio (SI), and 0.1mg/kg.d TPL and 3 mg/kg/d DDP significantly decreased the SI compared with the control group (P<0.05, Table 1). 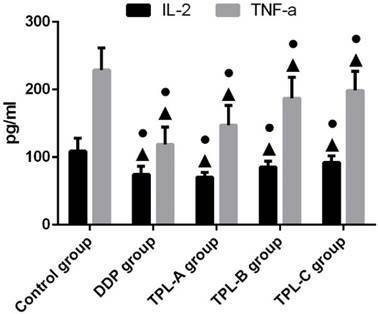 In addition, 3 mg/kg/d DDP, 0.1mg/kg.d TPL, 0.05 mg/kg.d TPL, and 0.025mg/kg.d TPL significantly reduced the inflammatory factors IL-2 and TNF-a (Fig 2). After treatment with different drugs, the apoptosis rates in the control group, DDP group, LY294002 group, TPL group, LY294002+DDP group, and TPL+DDP group were (5.87±1.815)%, (14.90±1.253)%, (11.20±1.682)%, (39.0±3.816)%, (27.67±1.834)%, and (51.13±3.325)%, respectively. For the single drug group, DDP, LY294002 (the inhibitor of PI3K), and TPL significantly promoted the apoptosis of COC1/DDP cells (P<0.05), of which LPS possessed the highest inhibition rate (Fig 3). 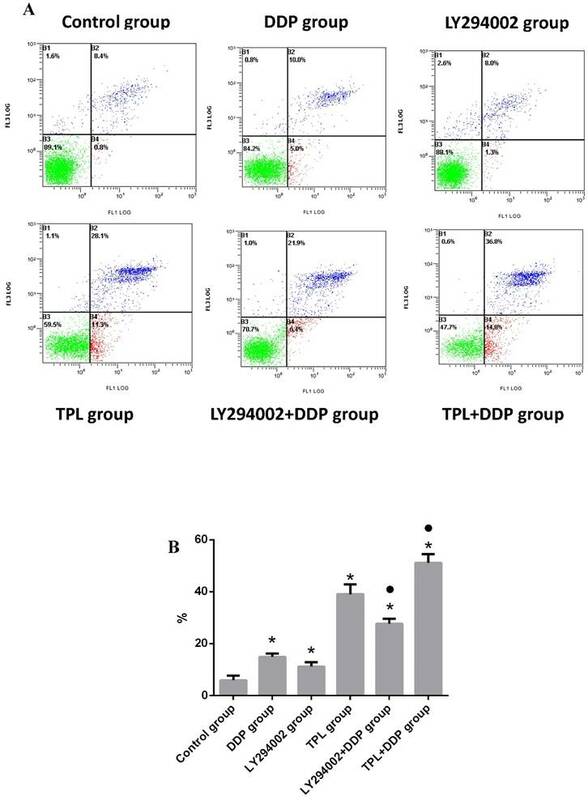 Compared with the DDP group, the combination of LY294002+DDP and TPL+DDP significantly promoted the apoptosis of COC1/DDP cells (P<0.05), and the TPL+DDP group possessed the highest apoptosis rate among all tested groups. To better understand the sensibilisation mechanisms of TPL to DDP, protein expressions of Akt, p-Akt, GSK3β, and p-GSK3β were compared in the control group, DDP group, LY294002 group, TPL group, LY294002+DDP group, and TPL+DDP group. As seen in Fig 4 and Table 2, the protein levels of Akt and GSK3β remained constant, whereas phosphorylation of Akt and phosphorylation GSK3β significantly decreased in the treatment groups (P<0.05). The TPL + DDP group possessed more inhibition effects than any other group (P<0.05). Moreover, the significantly decreased ratio of the phosphorylated Akt and GSK3βsuggested that TPL could significantly enhance the inhibition effect of DDP on COC1/DDP cells. Comparison of the tumour parameters among the control group, DDP group, TPL-A group, TPL-B group, and TPL-C group (mean ± SD, n=8). Note:●P<0.05 (compare with control group). SI: spleen cell transformation rate. Effect of TPL on the expression of IL-2 and TNF-a in the serum of tumour-burdened rats. n=8. The gray values of target proteins in Fig 4. Note: *P<0.05 (compare with control group); ●P<0.05 (compare with their corresponding single group). n=5. Effect of DDP (3.13 ug/ml), LY294002 (10 uM), TPL(10 ng/ml), LY294002 (10 uM)+DDP(3.13 ug/ml), and TPL(10 ng/ml) + DDP (3.13 ug/ml) on the apoptosis of COC1/DDP cells. n=5. 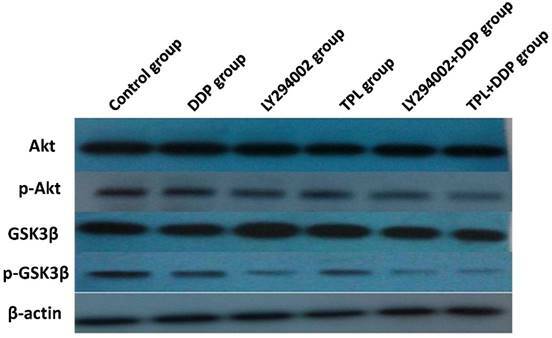 Effect of DDP, LY294002, TPL, LY294002+DDP, and TPL + DDP on the expression of AKT, p-Akt, GSK3β, p-GSK3β, and β-actin. n=5. The combination of curative resection and platinum‑based chemotherapy has greatly improved the survival length of EOC patients, while severe adverse side effects and drug resistance to DDP have hindered their clinical application . Therefore, naturally occurring, plant-derived phytochemicals are increasingly being investigated as potential therapies for cancers that can influence multiple signalling pathways and enhance the activity of conventional chemotherapy and radiation therapy [23, 24]. As one of the important anti-cancer agents, TPL had been mainly studied for its pleiotropic anti-cancer activities via inhibiting proliferation and inducing apoptosis of various cancers in vitro and in vivo, and it also could effectively induce the apoptosis of drug‑resistant multiple myeloma and cervical cancer [8, 9, 13, 25-32]. In the present study, we first evaluated the anti-cancer effect of TPL both in vitro and in vivo, and we then studied its sensitisation effect on DDP in vitro. The results indicated that a low concentration of 3 ng/ml TPL significantly inhibited the growth of COC1/DDP cells (P<0.05), and a stronger inhibitory effect was observed when enhancing the TPL concentration and prolonging the action time (Fig. 1B). In addition, the 35% and 55% COC1/DDP cells arrested in the G0/G1 phase indicated that 3 ng/ml TPL and 50 ng/ml TPL could significantly promote the apoptosis of COC1/DDP cells (Fig 1C, P<0.05), which was confirmed by the obvious apoptosis characteristics of COC1/DDP cells treated with low and high concentrations of TPL (Fig 1D). As more and more studies indicate that cancer development and treatment have a strong connection to the host's immune system, conventional rats, rather than immune deficient mice, were chosen to study tumour inhibition by TPL, and an orthotopic mouse model of ovarian cancer was established using F344 rats injected with NuTu-19 cells. As shown in Table 1, both 0.1mg/kg.d TPL and 3 mg/kg/d DDP significantly reduced the tumour weights (P<0.05) and SI and lowered the inflammatory factors IL-2 and TNF-a in rat serum (Table 1 and Fig 2). Next, we further tested the sensitisation effect of TPL to DDP in vitro, and we found that the combination of TPL and DDP possessed the highest apoptosis rate of (51.13±3.325)% and significantly enhanced the phosphorylation of Akt and GSK3β with the constant expression of Akt and GSK3β (Figs 3 and 4). Currently, a large number of small molecule signal transduction inhibitors are undergoing clinical evaluation for the treatment of cancers. As one of the most important pathways, the PI3K/Akt pathway was suggested to up-regulate in 30-50% of prostate cancers, and molecular changes in the PI3K/Akt signalling pathway have been demonstrated to differentiate benign from malignant prostatic epithelium and have been associated with increasing tumour stage, grade, and risk of biochemical recurrence [33-35]. The phosphatase and tensin homologue (PTEN) tumour suppressor is a phosphatidylinositol D3-phosphatase that counteracts the effects of PI3K and negatively regulates cell growth and survival, and GSK3β participates in PTEN phosphorylation by providing feedback regulation of PTEN . Therefore, the significant reduction of phosphorylation Akt and GSK3βcontributed to the tumour apoptosis and tumour suppression in the TPL+DDP group (Fig. 4). In conclusion, we show that TPL or TPL + DDP could promote cell apoptosis and tumour suppression via the PI3K/Akt pathway, and the sound sensibilisation effect of TPL could assist DDP to lower the resistance of EOC to cisplatin, which indicates that TPL is a promising agent that should be further studied in combination with other chemotherapeutic drugs for the treatment of human EOC. This work was supported by grants from the National Natural Science Foundation of China (No. 81260382,81503364, 31560264) and the Jiangxi Government (2009JX02571, 20122BAB205006, GJJ08074, 20151BAB205001). Corresponding authors: Dr. Buzhen Tan, Department of Obstetrics & Gynecology, The Second Affiliated Hospital of Nanchang University, Nanchang, Jiangxi 330006, PR China. tanbuzhencom; Tel: +86-791-86266912 or Dr. Tingtao Chen, Institute of Translational Medicine, Nanchang University, Nanchang, Jiangxi 330031, PR China. chentingtao1984com; Tel: +86-791-83827170.